If you happen to stumble across my website and I'm not servicing your area browse around and see if I am recommending someone in your area. 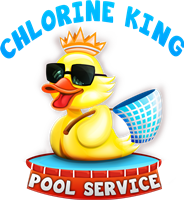 Chlorine King Pool Service wants the best for your pool even if it's not us taking care of it. It's tough to find someone that's trustworthy and reliable to take care of your pool. I hope this will help you in doing just that. I'm also covering not only service and repair but other things like licensed electricians, pool education, etc. The ultimate goal is to have any resource for swimming pools one would need here on this page. The people I'm recommending are friends of mine that I have met in the pool business. These are people that I have shared knowledge back and forth with and I know they will take care of you when you're ready. So go ahead and get to looking.